Today Marvel’s Runaways become stars of the small screen with the debut of their series on Hulu and their much-wanted omnibus collection has finally been announced. 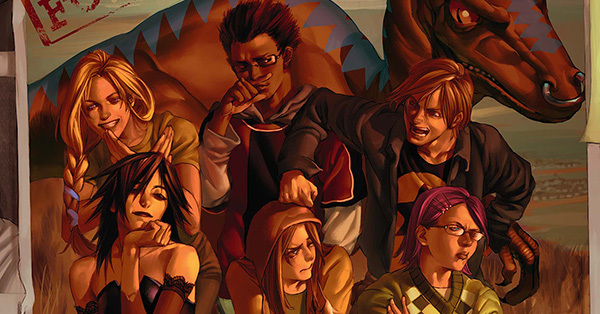 To commemorate this momentous double occasion, I’ve updated The Guide to Marvel’s Runaways! If you don’t need a complete listing of every comic book issue the Runaways have ever starred in, but would like to learn a little bit more about them and figure out where to start (or, even just figure out of you want to watch their TV show), just keep reading! The Runaways aren’t a super team with a defined mission statement. They are an accidental family of teens who were thrust together by fate and by their parents. Caution – spoilers for the opening issues of the comic and the first episodes of the show follow! The original cast of Nico Minoru, Karolina Dean, Molly Hayes, Chase Stein, Alex Wilder, and Gertrude Yorkes are forced to hang out with each other on the irregular occasion of their super-rich parents holding a special meeting about their charity foundation. The kids don’t have any particular connection to one another – some are chummy in the manner of distant cousins, while others barely speak to each other. That all changes when one year they accidentally eavesdrop on their parent’s meeting. They discover their parents are actually super villains, each with a different kind of power: the Minorus are magical, the Deans are aliens, the Hayes are mutants, the Steins are scientists, the Wilders mob bosses, and the Yorkes time travelers! When the kids witness their parents commit an unspeakable crime, they all run away from home together to try to come to terms with the evil deeds that supported their lavish lifestyles. They gradually come to accept and take ownership of their inherited powers so they can plan to defeat their parents … except, one of the kids is a mole for all of their families! After the end of their first, self-contained story, The Runaways continued as a surrogate family in two more ongoing series and a pair of mini-series that all ended by 2010. Since then, the team has been adrift – appearing as occasional guest stars, with only Nico and Chase getting any extended attention in Avengers Arena. Getting started with The Runaways is easy – you just start at the start. Their initial series tells a complete, compelling 18-issue story with no tie-ins or cliffhangers, and no subsequent series offers as clean of a starting point. 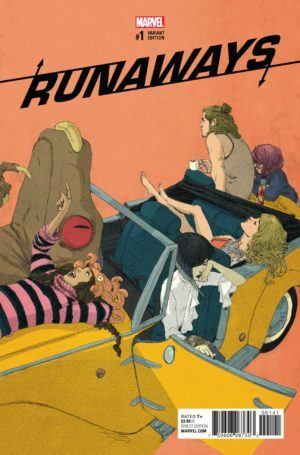 The easiest way to pick it up is in a single book – Runaways: The Complete Collection Volume 1. There are also smaller trade paperbacks and digest editions that contain each of three story arcs from the run – you can find the details on those in the Runaways Guide. In 2016, it seemed like Nico Minoru and Victor Mancha were poised for a major break-out from the rest of the cast, due to their appearances in A-Force and The Vision, respectively. However, once those series ended in 2016 neither character made a further appearance. In a surprising twist, in 2017 the sole Runaway to appear in Marvel’s Universe was Alex Wilder in an arc of Power Man & Iron Fist! That changed in the fall of 2017, with the launch of a new Runaways ongoing series at the start of Marvel Legacy. Like many Legacy-era books, this is less of a “jumping on” point and more of a “welcome back” banner. 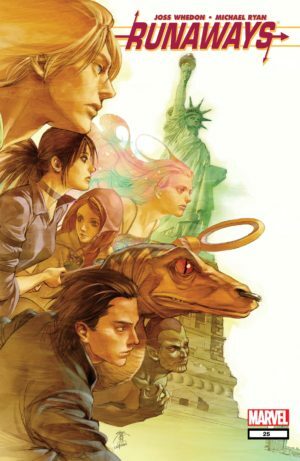 The opening arc might as well be called “Runaways Reassembled,” as it methodically rebuilds the team – with some mysteries lurking in the background. While the 2017 series is accessible to new readers, I don’t think the initial story would be satisfying without reading all of Vaughan’s run first. The series’ first collection has been announced for 2018. The Runaways debuted slightly ahead of Marvel’s era of collecting every single issue of every single title, but thanks to their enduring popularity from 2003 to 2010, we’ve missed nary an issue of their appearances from their first #1 to present day! In fact, we’ve almost got all of Runaways in oversize format. Free Comic Book Day 2006, which did not appear in the original trade paperback coverage of the series, but has since been collected in all further re-collections like oversized hardcovers and complete collections. The Civil War series is only collected in oversize along with other Civil War material, not with Runaways comics. A 4-page framing sequence in Runaways Saga, a reprint comic that recapped the story so far. This has only been collected with the third Complete Collection, so far. That’s it! There’s nothing stopping you from owning every single Runaways comic in print on your very own collected editions bookshelf. What are you waiting for? Visit the Guide to Marvel’s Runaways for all the details!